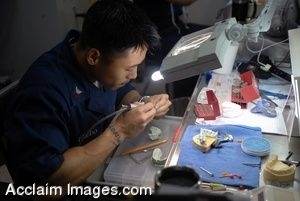 Description: Clip art photograph of Hospital Corpsman 1st Class Noel Toledo, from Chula Vista, Calif., smoothing down a crown that he made in the dental lab aboard the Nimitz-class aircraft carrier USS Ronald Reagan (CVN 76). The Ronald Reagan Carrier Strike Group is on a routine deployment in the U.S. 7th Fleet area of responsibility operating in the Western Pacific and Indian oceans. (U.S. Navy photo by Mass Communication Specialist Seaman Apprentice Oliver Cole). Clipart photograph by Department of Defense Public Domain.